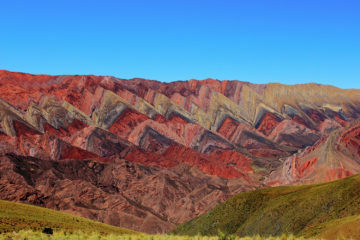 Hugh MacDermott’s escape to Argentina from England was epic. 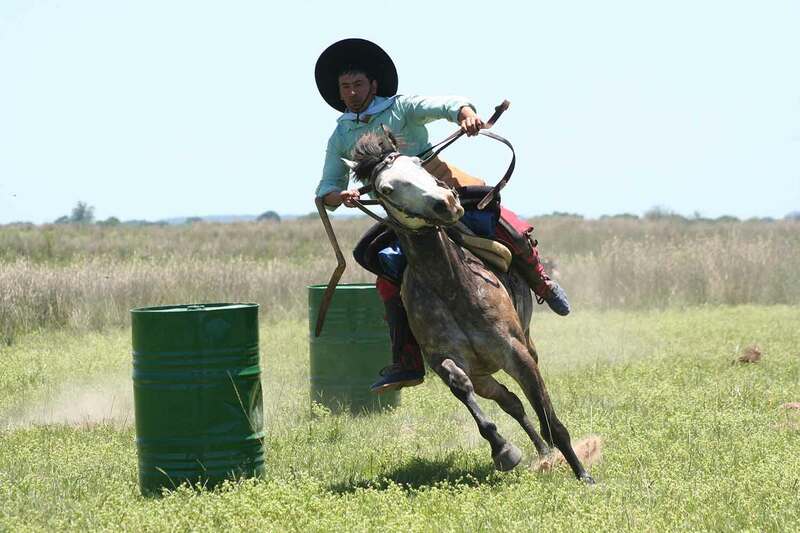 Inspired by the book Tschiffely’s Ride, the story of one long-rider’s 10,000 mile journey from Argentina to Washington D.C., he has spent nearly a decade riding across South America, with the spirit of adventure as his compass, most notably living life among the Gauchos. He gained their respect without ever hiding his sexuality and now runs a travel company with his fiancé Paulo – best known for challenging, experiential itineraries on horseback, one of which I’m about to embark on. It turned out my Spanish was better than I had thought. 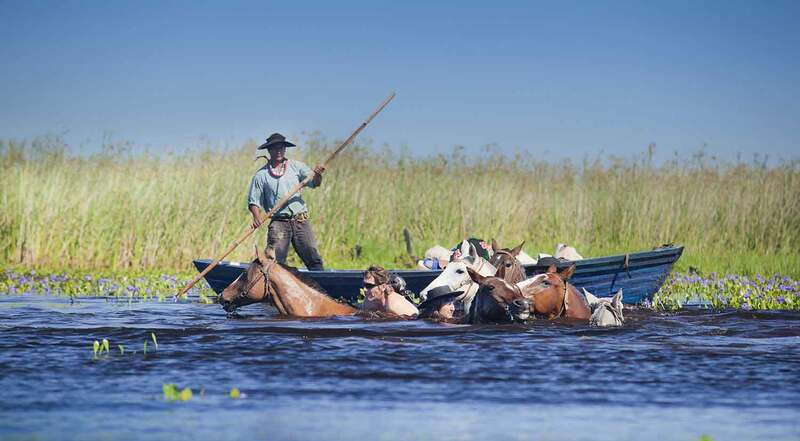 As we rode to the village of Ñupuy, the Pampas grassland was replaced by lagoons. 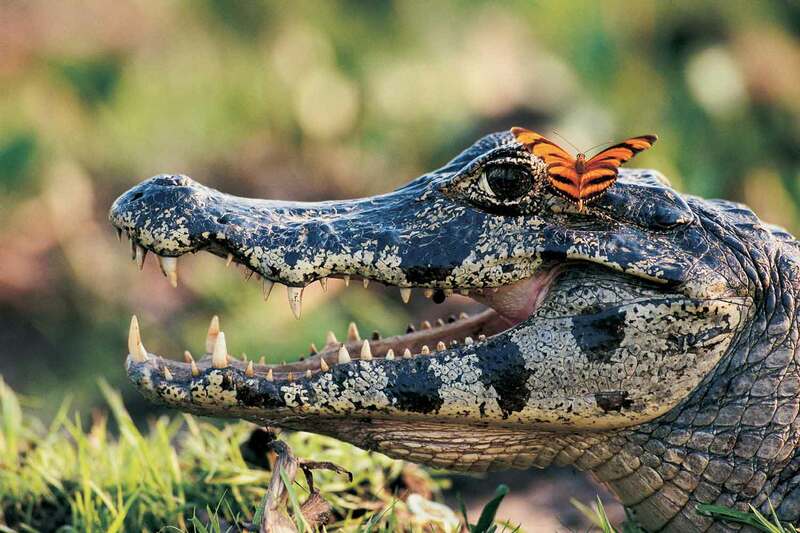 We were in the Iberá Wetlands, often called the little cousin of the Brazilian Pantanal – but it’s the size of Belgium. Our luggage, driven down by support trucks, was loaded onto flat-bottomed boats. It dawned on me that we were going to ride across in neck-deep water. Cayman alligators could have eaten us here, but luckily (for us) there was an abundance of Capybara (giant, pig-sized hamsters), their favourite meal. I was comforted by the large audience of marsh deer on the side of the Carambola River, watching the commotion. My horse swam like a pro, thankfully, because I didn’t. 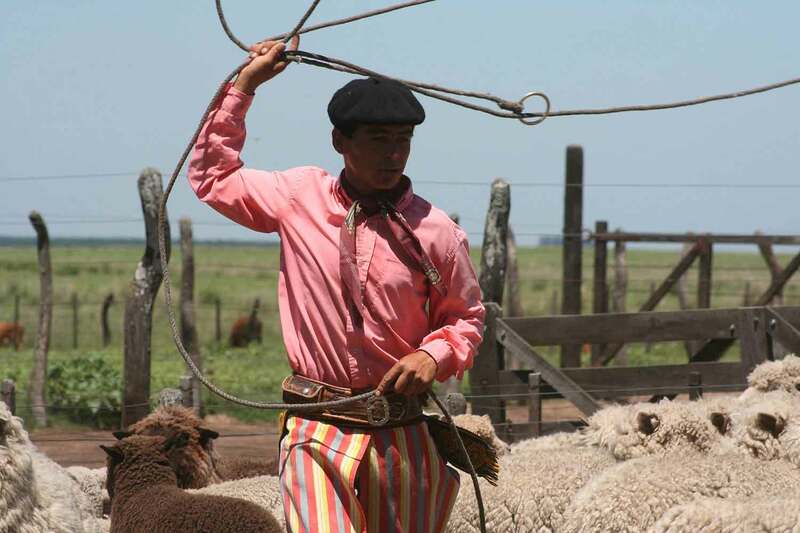 We overnighted in a Gaucho house and learned more about the area. It’s pretty old-world and feudal and things haven’t really changed in the last century. That was until Doug and Kris Tompkins came along and bought swathes of land for their Conservation Land Trust. 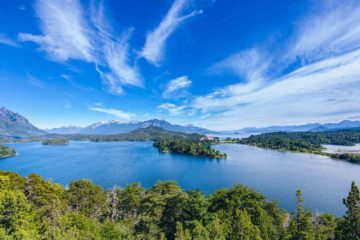 The owners of outdoor brands North Face and Patagonia respectively, their legacy was to turn it into a National Park and bring back the once native flora and fauna that had been cleared for agriculture. 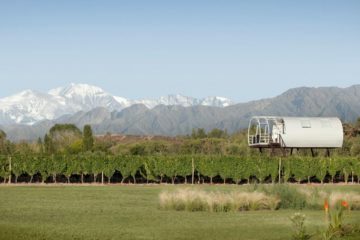 A day later, we were headed to the Tompkins’ expansive Estancia Rincón del Socorro – a short flight away by small plane – a luxurious ranch at the heart of the Trust’s sustainability efforts. We went on a couple of safaris, tracking and learning about the wildlife of the area – tapirs, jaguar, storks – species that are now thriving here. I met my new team of six unnamed horses who took it in turn to carry me between estancias. 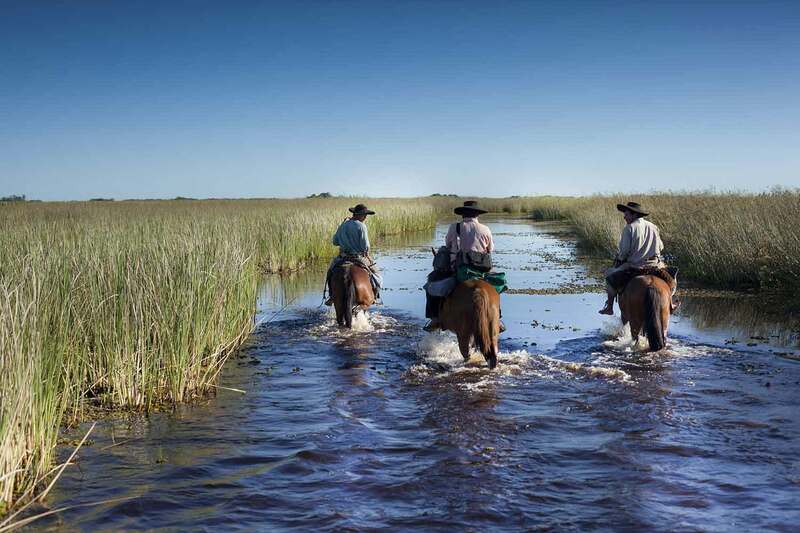 As we rode out over flat Pampas for the Estancia Buena Vista, I noted how quiet and disorienting it was. There were no landmarks, so it was easy for your mind to drift. 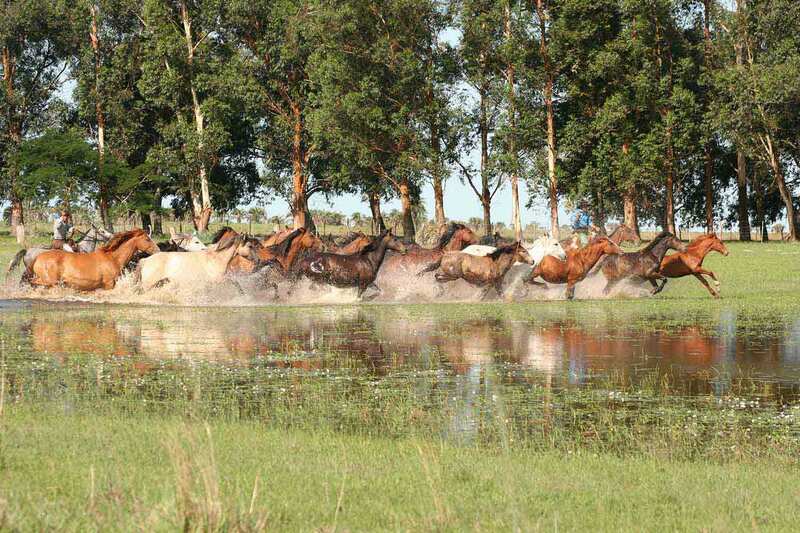 We passed other Gauchos and their herds; stationary farming being more effective now. 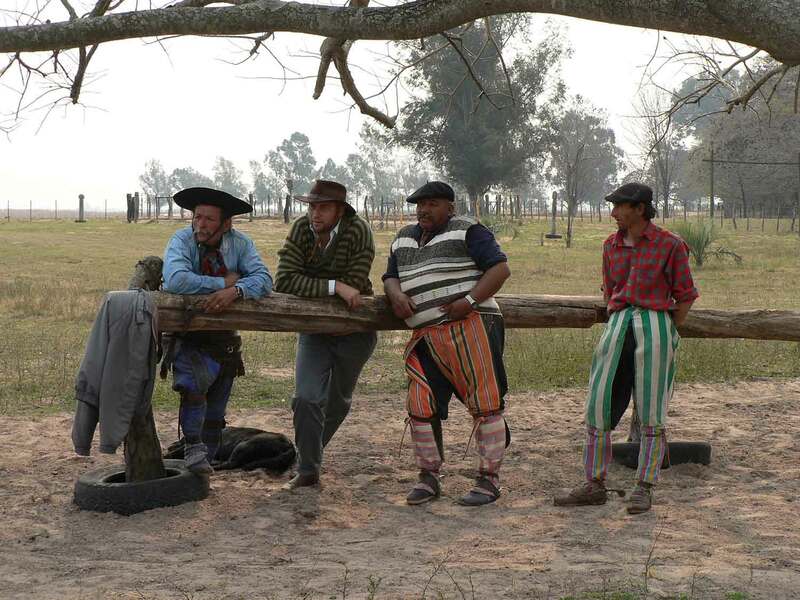 Gaucho culture is still strong here and they’re very proud of their lineage, dressing in a way that is distinctive to the area. There was a lot of banter and horseplay (no pun intended) between them; they teased Hugh about his upcoming wedding, asking him who will wear the dress – albeit in an affectionate way. It seemed that despite the masculine culture, being gay isn’t a big deal. It’s much more about fellowship; in the harsh interiors, you have to look after each other. The ride on the final leg of the journey was more difficult. Everyone banded together and there was plenty of camaraderie from both the group and the Gauchos. When you travel together like this, you form a real bond. Sadly, the Gauchos aren’t on Facebook, otherwise we would’ve kept in touch. My life in London is so far removed from their existence, yet it was amazing to spend time with them. Felipe unfolds a page from a magazine to show me a picture of him from when Hugh produced a fashion shoot for Harrods out here. Felipe is captured beautifully by photographer Jane Hilton. He stands adorned in a Balenciaga jacket worth over ten thousand pounds – I wondered if he knew. 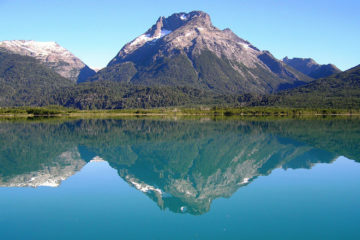 People come to Argentina for a variety of reasons, but to ‘really’ travel is to do more than just visit. Hugh has developed something very special in what he does here, rooted in his own personal discovery and exploration. 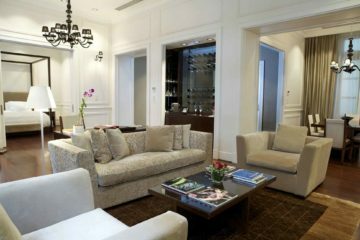 It allows him to now share what is usually inaccessible with adventurous travellers. By spending time with him in what is just a small part of a very large country, I got a genuine understanding and appreciation of what one part of the ‘real’ Argentina stands for.